The Osprey is an amazingly capable tube amplifier that drives speakers with all delicacy, attention to detail, and musicality of the Nighthawk and Blackhawk but, with even more power and authority. Available in Metallic Black with Silver trim. The Osprey is an amazingly capable tube amplifier that drives speakers with all delicacy , attention to detail, and musicality of the Nighthawk and Blackhawk but, with even more power and authority. Available in Red Wine, Pearl White, and Jade! "Like old Mac MC30s, the Raven Osprey is perfect for stand speakers; the Legacy Studio HDs and the Amphions really shined — with a spot-on bass/treble balance and a golden, sparkling top end. 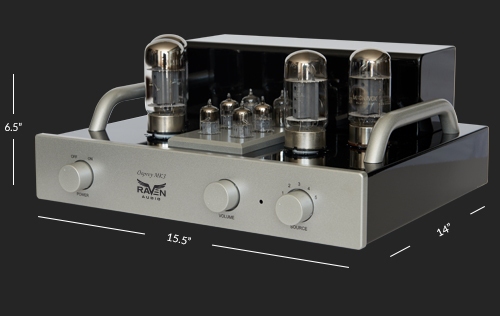 the Raven Audio Osprey is a good choice for a low-powered, tube integrated for small-room listening. 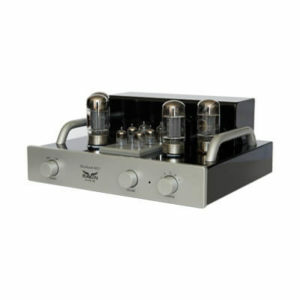 Vinyl fans, hi-res audio aficionados and those who just like the glow of the valve, will like this amp." The 30 watt per channel Osprey Integrated has all of the Blackhawk's features and sound characteristics with 50% more power. If you are driving speakers that are lower efficiency or just want more power the Osprey is a great choice. It is an uncompromising member of the Avian Series with highest quality components. It handles digital and analog with a no compromising smooth, detailed and accurate sound across the spectrum. Unlike most tube amplifiers, there is no roll off in the high frequencies. You will hear every detail in any recording. A massively built proprietary power supply allows the Osprey to drive speakers well beyond a typical 100 watt per channel solid state amplifier. Extraordinarily speed results in a tight, articulate, and well-defined bass. All Raven Audio products are made in the U.S.A. and are built to military specifications. They last a lifetime. Quality is in our DNA! All of our MK3 series Avian integrated amplifiers have upgraded nonpc board audiophile grade RCA connectors. They are made of 99.95 percent oxygen-free copper and are gold plated. Each heavy duty connector is individually hand soldered to oxygen free copper wire. All of our MK3 series Avian integrated amplifiers have upgraded nonpc board audiophile grade RCA connectors. They are made of 99.95 percent oxygen free copper and are gold plated. Each heavy duty connector is individually hand soldered to oxygen free copper wire.